Terrified by technology? Not got a clue when your tv screen goes blank? 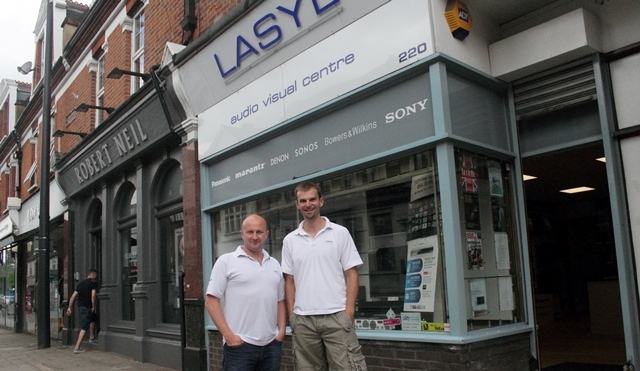 You need Lasyl, the Sheen shop with the unusual name, whose expert staff can bring your television back to life and then even go on to fit out your whole home with amazing plasma screens and stunning audio systems while they are at it. “We install the stuff that people use every day and get great enjoyment out of,” explains Chris Hellel who runs the business with his brother Dominic. Technology holds no terrors for the brothers – they first started working in what was their dad’s shop when they were kids. He started the business 30 years ago and the unusual name is easily explained. It’s a combination of his name Larry, and his wife’s, Sylvia. Quite simple really. Sadly, their father – a well-known figure in Sheen – passed away last year, but under the brothers’ dynamism and expertise, their shop, which has just undergone a re-fit, and the services it offers are flourishing. “A decade ago we were just a retail shop, but now we offer a full audio and visual refurbishment of your home as well,” said Chris. This can range from a few thousand pounds up to a surprising £50,000 for the full works in a large house. One customer recently spent £9,000 on one room alone, putting in the finest sound system on the market. The speed of change in the visual and audio world means that they have to keep up with the technology which they do by attending training courses provided by major suppliers like Panasonic and Sony. They are also invited to demonstrations to be shown new products which are about to be launched on the market. 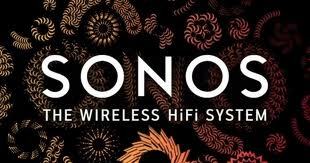 Much in demand currently is Sonos, a wireless audio distribution system used for listening to music and the radio around the home via the internet. He predicts that the next big change coming to our homes is video-streaming via smart TVs connected to the web.